The 1128th meeting of the Chicago Coin Club was held December 12, 2012 at Marcello’s Restaurant, 645 W. North Avenue. Following a cocktail hour President Jeffrey Rosinia called the meeting to order at 7:00 PM with 48 members and guests present. Richard Hamilton delivered the invocation. Banquet sponsors included: William Burd, appetizer; Mark Wieclaw, appetizer; Sharon and Kevin Blocker, speaker’s dinner and appetizer; and Steve Zitowsky, reservation deposit. As this was the Annual Banquet, a motion was passed to adopt an abbreviated agenda. First V.P. Elliott Krieter introduced the evening’s speaker, Robert Wallace, who delivered a program on A Coin Collecting American Boy in Rome. Following a question and answer period, Elliott presented Wallace with an engraved club medal and an ANA Educational Certificate. President Rosinia spoke of the numismatic education shared through exhibiting at monthly meetings and the creation of the Cabeen Award to acknowledge top exhibitors. V.P. Krieter presented the following engraved medals: First Place: Richard Lipman; Second Place: Mark Wieclaw; and Honorable Mention: Eugene Freeman, Robert Leonard, Robert Feiler, and Robert Weinstein. The slate of officers for 2013-2014 announced at the November meeting was unanimously elected. They included: Elliott Krieter, President; Richard Lipman, First VP; Marc Stackler, Second VP; Carl Wolf, Secretary; Steve Zitowsky, Treasurer; William Burd, Archivist; Jeffrey Rosinia, Immediate Past President; Directors: Mark Wieclaw, Dale Lukanich, Steve Ambos, and Robert Feiler. Past President Robert Leonard swore in the new officers. The application for membership of Dennis Hoelzle received first reading. Incoming President Elliott Krieter presented outgoing President Jeffrey Rosinia with an engraved Past President medal in appreciation of his service. A warm round of applause followed. Jeff then passed the gavel to Elliott. A raffle was held for poinsettia plants donated by Jeff Rosinia and used as table center pieces. When the meeting adjourned at 8:55 PM, Jeff Rosinia delivered a trumpet serenade of several holiday songs. Like many of you, I began collecting coins as a youngster, looking through my parents’ pocket change, Red Book in hand, visiting the local coin store, and subscribing to those weird mail order outfits that send you coins on approval, as I recall mostly demonetized aluminum pieces from the far corners of the globe, mostly valueless but interesting and only pennies apiece. Then in 1962 when I was 12, my family moved to Rome for 4 years, as my father, music critic for the Baltimore Sun, became Rome correspondent. Rome in 1962 was far more tranquil than today, but remained pretty impoverished, still showing the effects of WWII, in particular with many mutilati di guerra (war disabled), for whom designated seats were reserved on buses. In tobacconists, cigarettes could be bought by the one (also, people smoked tobacco taken from butts found on the street — I tried this, it was harsh), dads, moms, and infants scooted around together on Vespas (there were few cars), my YMCA summer camp — 6 weeks in Sardinia — cost all of $48, and bus tickets were 3 cents, although you could give the conductor a cigarette instead. Lots of smokers in those days! But things were changing fast in 1960s Italy. My family witnessed “il boom,” a steady progression toward prosperity. My younger brother and I soon discovered Rome’s Flea Market, spread out through the streets south of Porta Portese, “the port gate,” along the Tiber in Trastevere. This sprawling market started after the War as a black and grey market, only on Sunday mornings, opening at first light in the old peasant way: out of bed in the dark so one could start working the fields as soon as it got light, after which a big late lunch, the meal of the day with wine, then siesta. Today some 4000 sellers rent spots in these streets, selling everything from antique credenzas to used carburetors, stolen motorbikes, bootleg CDs, plastic birds that squawk “Ciao,” heaps of used clothes and cheap Chinese bags, old comic books, ancient Leicas and so forth, Russians selling icons and old military gear, Ethiopians exotic handwritten bibles, all in a carnival atmosphere of hollering and jostling, stall owners blaring badly dubbed dance music amid the smoke of corncobs roasting on the grill. In the ’60s some men used to play 3 card monte on little cardboard tables and I learned the hard way that painful rule, never play another man’s game. My father bought a fair amount of Greco-Roman art at the Flea Market, some of it pretty dubious, but always decorative. As a young coin collector, what caught my eye were the buckets of ancient and medieval coins at a couple of Flea Market stands, and if you can forgive me the vulgar offense of mentioning price, the coins from these buckets were 50 lire — 8 cents — apiece, and my weekly allowance was 600 lire, a dollar, so I could afford them. Some of these coins got lost over the years, and I came to see that many of them were pretty shot, but I still have a few. The great contemporary collector of Greek coins Basil Demetriadis has said that every coin has something of interest. Maybe this is true of this sample from my early collecting days. Trajan Decius, Egyptian tetradrachm, billon, year 2 of reign is 251 AD. On the reverse, L is probably a modification of the Egyptian hieroglyph for year; B is Greek for two. Trajan Decius, born in Serbia, was a competent Senator and administrator but ruled only 2 years, persecuting Christians and dying in battle against the Goths. Note the tough guy portrait. Larger versions of most images are available; click on a displayed image to obtain an image four times the area (if available). Most can be doubled three times! Next a bronze follaro of the Norman Ruggero I, Roger, “Grand Count of Calabria and Sicily,” from 1072 to 1101, struck at Mileto (his capital; he died here of old age). Struck between 1098 and 1101. Knight on horseback riding left, holding lance. The Virgin seated right on throne, holding Infant Christ, both wearing nimbus crowns. This coin is actually a bit scarce. Where were these bucket coins found? — an all-important question today, but not back in 1962. 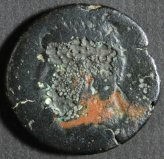 Especially with the advent of deep plowing after the war, peasants started finding a lot of old coins on their farms — the condition will tell whether in pot hoards or loose — and also in rivers, and so our third coin: this Antoninus Pius sestertius, another 8 cent coin, has what is called a “Tiber patina,” that is: no patina, and lots of corrosion, but you can see something. The attribution comes from the ruler’s profile. The reverse: Apollini Augusto SC, Apollo holding patera and lyre. Minted in 142 AD, early in Antoninus’ reign. In ancient times, people dedicated coins to river gods, which sank into the mud at the bottom. Divers recovered 4217 coins (but only 1 in 20 were sestertii) from the Liris River at Minturnae, south of Rome, where the Via Appia crossed it, plus anchors, amphoras, statuettes, lead seals, and military gear from WWII. Similarly, at Roman Piercebridge in the UK, divers found “hundreds of votive offerings including coins, brooches, rings, and figurines” of Cupid, a ram, and Hercules (Britannia 1999). These coin finds mostly represented the coins in circulation, and they were mostly Roman. In ancient and medieval Italy a similar if perhaps not so extreme situation will have prevailed, especially in isolated areas that did not strike their own coins but had been monetized. How did that Trajan Decius get to Italy? Along with Egyptian wheat? In the purses of Roman soldiers? Or did perhaps a more recent tourist carry it to Italy as a souvenir? Since the 1980s I’ve often traveled to Rome and always return to the Flea Market if I’m in town on a Sunday. Until quite recently, people still set up in the dark, and started selling as soon as it got light. Here are photos of the main two Flea Market coin dealers, first Bruno Nobili — in the ’80s he told me he’d been selling all kinds of coins and paper money in the Market every Sunday for 28 years. Short, solid, red faced, taciturn, he had been a British prisoner of war in N. Africa during WW II and so spoke a little English. He also used to sing snatches of Fascist and other old songs, che ci lascino lavorare... [would that they let us work]. 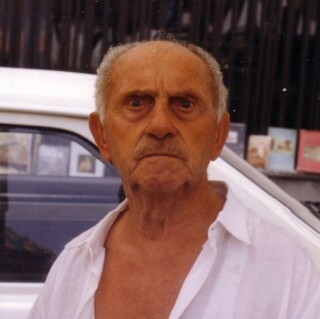 In the ’80s when I walked down to the Market through the cold winter dark at 5 am, Bruno would be sitting at his spot in his little white Fiat with his wife, then gradually bring out his wares, with the Romanine, the “little Romans,” last. I always wanted to be the first to look at the Romanine, and in fact usually someone would arrive to wait behind me before the “little Romans” appeared. As Bruno told me, he began to sell as soon as there was enough light to see the coins. He and his wife were a team, nice guy tough dame, he would sometimes try to lower the price but his wife would say no: he’d usually give you 10%, also liberally applying the term “raro.” I once asked Bruno where he got his coins. He answered diplomatically, “they bring them to me.” I once visited his apartment, a nice middle-class one, and saw that he had all the Sears ancient coin value books. Over time he sold me some decent Roman coins. 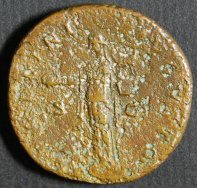 This is a sestertius of Philip I The Arab, emperor from 244 to 249; born in Syria, was said to be sympathetic to Christians. Another tough guy, he was killed by Trajan Decius, whom we have met. By merest chance on the web I found a photo including my other Flea Market dealer: he’s standing in the back, just under the red ribbon, with a sheen of silver hair (if I ever knew his name I’ve forgotten it), inexpensive clothes but typically something of a snappy dresser, grizzled chest exposed, wearing several medallions, and a talker, unlike Bruno, lots of fakes mixed in but he would always tell me which were fakes and also which were common. He refuses to bargain, but his prices are okay. I would watch people come up to him pulling coins from their pockets, to sell to him. Once someone followed me out of the market, an out-of-towner from Ascoli Piceno a town founded by the Romans — Pompey the Great came from there — over on the Adriatic, wanting to sell some pretty decent coins from his collection, but I didn’t buy. 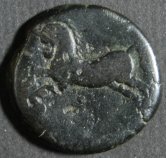 Here’s a coin I got from this dealer: a bronze from Syracuse struck under the general Timoleon ca, 340 BC. Head of helmeted Aphrodite, and please note a second face appears in Aphrodite’s helmet! Probably an overstrike, rather than double-struck. 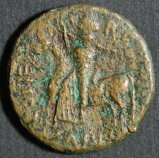 This next coin, pretty destroyed, is a coin probably of Micipsa (or else his father Masinissa), ruler of Mauretania in North Africa from 148 to 118 BC, a friend of Rome but father of Jugurtha, who proved to be one of Rome’s dangerous enemies. It features a bearded head (the god Melquart?) and a galloping horse. I bought this poor specimen in Durham in northern England, for 6 pounds, from a tray of bric-a-brac in a street market; it was the only coin in the market. The archaeologist in charge of coins for Yorkshire saw this coin and asked me, what did I think a coin of Micipsa was doing in a flea market in northern England? He answered his own question: it was probably picked up by a British soldier in N. Africa in World War II — I wonder if he met Bruno Nobili? — and brought home as a souvenir. As you know, British treasure trove laws permit thousands of metal detectorists to hunt for old coins. The Yorkshire archaeologist told me that having to examine the thousands of coins brought to him each year was an ongoing nightmare. But the great result is that British coin hoards are well recorded, unlike hoards from any other area of the Greco-Roman world. 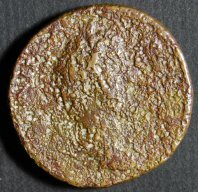 Lots of ancient coins are found in France also. In Provence there’s a dealer who travels from town market to town market where I’d see him, selling higher end coins than what we’ve seen so far. 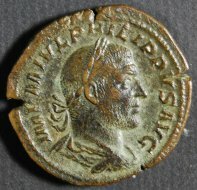 In Arles I bought this coin, an as halved for small change, from Nemausus (Nîmes), a veterans’ colony set up by Augustus, from the end of the 1st century BC: portrait of Octavian/Augustus (the missing portrait was his general Agrippa); alligator biting right, traces of palm tree and chain. The crocodile chained to a palm tree symbolized Octavian’s defeat of the Egyptian Cleopatra at Actium in 31 BC, ushering in the Roman Empire. Finally, inevitably, one finds some fakes in flea markets, some of them ancient, some contemporary. At the many souvenir stands outside Ephesos in Turkey, I saw lots of imitation coins for sale, and once was invited to the back of the tent — hush, hush! — for some genuine items: a cigar box full of only fakes! These guys followed me to the bus trying to sell me these items. I gave fellow passengers a lesson on how to identify fakes. 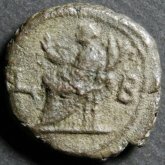 Here’s another, which I bought in Jerusalem in 1997: but this one’s an ancient plated coin, a legionary denarius struck by Marc Antony in 32/31 BC, in preparation for the battle of Actium where he joined forces with Cleopatra against Octavian but lost. III VIR RPC. LEG III. Two points are interesting. 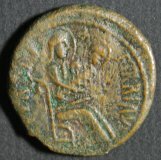 First, presumably this coin came back to Egypt with Antony’s men after the battle, and so ended up in Jerusalem. 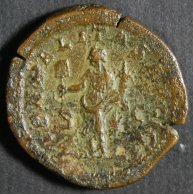 Second, it is plated: Antony was paying his legions with plated coin. In antiquity this was known. 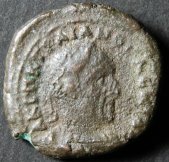 Pliny wrote, miscuit denario triumvir Antonius ferrum (NH 33.132), “Antony mixed iron with his denarii.” As “iron” and silver cannot be mixed, this may refer to Antony’s plated coins. My last coin was bought at the famous flea market in Jaffa last June. I was between conferences (one of them on early electrum coins) and was traveling around Israel. 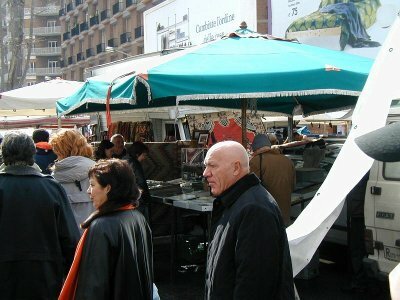 So I visit the market, asking about coins. The very first guy shows me a tray of worn but perfectly genuine “widow’s mites,” plus one prutah from the First Jewish War, 66-70 AD, in excellent condition, with an earthen or “desert” patina characteristic of Near Eastern coins. We bargain, he plays the game they all played that morning, special price because it’s the first sale of the day, I got it for maybe $20. Whoops, the next guy had a boxful of exactly the same coins, with the same color and patina. These were recent reproductions. I bought it for $3, maybe having learned just a bit how to play another man’s game. Rome’s Flea Market still carries on, although it now opens later, people set up around 8. By 10 it is absolutely packed. Also, there are now many merchants from India, Morocco, and elsewhere. Italians are more prosperous now — “il boom” — and mostly won’t do this work. I bought a leather belt from a merchant, the list price was 10 euros, I offered 3, he took it, and I later learned why. The belt was cardboard covered with plastic fake leather. Whoops! As for Bruno Nobili? In recent years he stopped coming to the market, and alas! died last June. The photo of him comes from a little obituary that appeared on the web: http://www.cittamese.it/attualita/337-ciao,-bruno. Many people remember him fondly. Fortunately, the snappy dresser is still there, every Sunday morning. When you go, say hello for me, and maybe pick up an interesting Romanina or two. He once told me he always liked to see me, because he knew he would make a sale that day. CPMX & CICF Harlan J. Berk, Ltd. The fifth meeting of the 2013 Chicago ANA Convention Committee was called to order by Host Chairman Mark Wieclaw on Wednesday December 5, 2012 at 6:00 PM in the offices of Harlan J. Berk, 77 W. Washington, Suite 1320, Downtown Chicago. The following members were present: William Burd, Richard Lipman, Eugene Freeman, Dale Lukanich, Paul Hybert, Steve Zitowsky, Sharon Blocker, Robert Feiler, and Carl Wolf. Although Harlan Berk was unable to attend, he left funds to cover the cost of dinner from Reza’s Restaurant and parking vouchers. Mark announced that Marc Ricard was unable to attend as his Mother passed away yesterday. Reported results with 48 volunteers enlisted. Plan for major recruiting efforts starting Jan 1. Committee members asked to keep the Host Chairman and Volunteer Chairman posted when they visit local clubs to promote the convention. All speakers need to give written permission allowing the ANA to record their talks and make them available to the membership. Each speaker receives 5 complimentary copies. Tell them of the YN and Scout activities at the convention and ask for shredded currency, coloring books, etc. Waiting for more information on a special Scout patch that would have segments for additional years. ILNA has volunteered to cover a portion of this cost. Will email all local councils with patch details when available. Consider directing all convention goers that arrive early into the Exhibit Area to wait for the Bourse to open. The decision was made to hold the Kick-Off Dinner at a rooftop bleacher on a residential building across from Wrigley Field. Several members asked that Rhonda be warned that the rooftop bleachers are not created equal. Rhonda confirmed the ANA will give the Club a budget of $6,000. The 2011 budget was $6250 with the Club raising another $1,200 in donations. Rhonda has asked the Rosemont Convention Center for 50 parking vouchers for each day of the convention. Medals for “Money Talk” speakers will be discussed at a Club Board meeting in Jan.
Eugene Freeman will send out the 2011 Restaurant Guide in electronic format and asked committee members to add to the list. Rich Lipman announced a representative from the Bureau of Engraving and Printing is interested in speaking before the Club at the Convention and everyone responded positive to this concept. Program people were encouraged to contact the representative and begin discussing topics. Mark announced the next meeting on Wednesday, January 23rd at 6:00 PM in the offices of Harlan J. Berk, 77 W. Washington, Suite 1320, Downtown Chicago. At the Chicago Bar Association, 321 S. Plymouth Court, 3rd floor meeting room. Please remember the security measures at our meeting building: everyone must show their photo-ID and register at the guard’s desk. Nearby parking: South Loop Self Park, 318 South Federal Street; that is two short blocks west of our meeting site. Note: Their typical rate of $29 is reduced to $6 if you eat at the Plymouth Restaurant, 327 S. Plymouth Court (next to our meeting site at the CBA), show them your parking ticket, and ask the restaurant for a parking voucher. The restaurant offers standard sandwiches, burgers, and salads for members who want to meet for dinner. Another before-meeting favorite of some members is the Ceres Restaurant, located inside the Board of Trade Building, at LaSalle and Jackson. The New World was discovered in 1492 and with it came the awareness of vast silver and gold deposits. In Bolivia a virtual mountain of silver was discovered! Spain quickly took advantage of this new found wealth and began to mint coins as early as 1498 from the Island of Hispaniola. Over the next 322 years and from 12 or more mints, Spain issued shiploads and shiploads of silver and gold coins, in uniform styles. This series of Spanish Colonial coinage makes for a wide, rich collecting series, which strongly influenced the early coinage of the United States. Numismatists who collect coins from any (or every) country in the Western Hemisphere need to attend this program. Often, collectors have difficulties identifying the different Spanish mints. Eugene will discuss the different mint marks and their corresponding Spanish Colonial mints. March 8-10 19th Annual Chicago Paper Money Expo (CPMX) at the Crown Plaza Chicago O’Hare, 5440 North River Road, Rosemont, IL. Admission is $5 for Friday and Saturday; free on Sunday. For details, refer to their website, http://www.cpmxshow.com. March 9 CCC Meeting - 1pm at the Chicago Paper Money Expo, which is held at the Crown Plaza Chicago O’Hare, 5440 North River Road, Rosemont, IL. No admission charge for our meeting. April 19-21 38th annual Chicago International Coin Fair (CICF) at the Crown Plaza Chicago O’Hare, 5440 North River Road, Rosemont, IL. Admission is $5 for Friday and Saturday; free on Sunday. For details, refer to their website, http://www.cicfshow.com. April 20 CCC Meeting - 1pm at the Chicago International Coin Fair (CICF), which is held at the Crown Plaza Chicago O’Hare, 5440 North River Road, Rosemont, IL. No admission charge for our meeting. April 25-27 74th Anniversary Convention of the Central States Numismatic Society at the Schaumburg Renaissance Hotel & Convention Center, 1551 North Thoreau Drive, Schaumburg, IL. Free public admission. For details, refer to their website, http://www.centralstates.info/conv.html. April 27 CCC Meeting - 1pm at the CSNS Convention, which is held at the Schaumburg Convention Center. If you would like to receive an email link to the latest issue instead of a mailed print copy send an email to chatter_editor@yahoo.com. You can resume receiving a mailed print copy at any time, just by sending another email.